Sol Giraldos is a Colombian intern supporting MRG’s cultural and fundraising work in our London office. She has been living in the UK since late 2011, but being abroad hasn’t detached her from Colombia, on the contrary, she is an active member of groups working towards improving conditions in her country, and is studying human rights and international politics. To describe the aftermath of Colombia’s recent NO vote in the peace plebiscite is not easy. The country and its people are going through a roller coaster of emotions, ranging from deep sadness to hope. And these emotions are not confined to those, who like me, expected a positive vote from the plebiscite and an end to the long and painful conflict. The decision is also affecting those who voted NO, because the country is currently in a social and political limbo. Life hasn’t stopped, but the referendum result is affecting us all in so many different ways. For indigenous communities and Afro-Colombians the uncertainty about an end to the conflict is worse, because they live in areas most contested by all parties to the conflict, and have been disproportionately affected, especially in terms of their risk of being attacked and displaced. MRG’s State of the World’s Minorities and Indigenous Peoples 2015 reports alarming levels of displacement, sexual violence and abuse against indigenous communities at the hands of the different armed groups, criminal gangs and security forces. Also, the presence of paramilitaries in urban areas is extremely dangerous for Afro-Colombians, especially in cities like Buenaventura where, according to government figures, 84 per cent of the population is black. 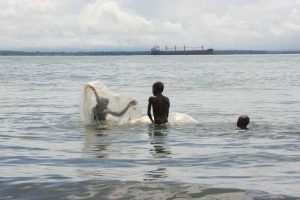 Additionally sexual violence is used in Buenaventura by armed groups as a means to control territory and terrorize the community, so Afro-Colombian women are particularly affected. In rural areas of the country most affected by the conflict, and where many indigenous and Afro-Colombian communities live, the YES vote for peace was overwhelming – a whopping 72%. On the contrary however, many people in the cities voted NO. It just goes to show that there is a great lack of understanding of the realities lived by indigenous and Afro Colombian communities, and the importance of in our lives of their history and traditions. They have not only been victims of the conflict for the last 52 years, they have been systematically discriminated against and ignored throughout modern Colombian history. The current Colombian peace process began officially in October 2012, but the talks were only between two actors in the conflict – the Colombian government and the FARC guerrilla group. The final accord comprises six points related to the issues agreed by the two parties: Comprehensive agricultural development, political participation, the end of conflict, a solution to the illicit drugs problem, victims, and implementation, verification and countersignature. Having suffered so much as a result of the conflict, the indigenous and Afro-Colombian communities took the initiative to fully support the peace process. They, as part of civil society, understood that the process between the government and FARC wasn’t possible without their support and input. 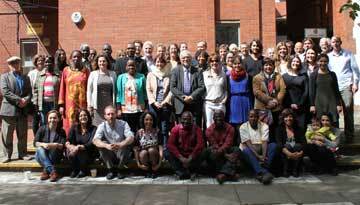 Hence, they worked together for three years, working with their own communities, nationally and at an international level, and finally achieved recognition of their work with the formation of an Ethnic Commission in Havana, Cuba, in August 2016. The land reform section of the agreement also takes into account the indigenous and Afro Colombian philosophy of buen vivir (good living) as one of the driving principles to alleviate poverty and fully satisfy basic needs, while respecting land rights, gender, ethnic and cultural diversity. 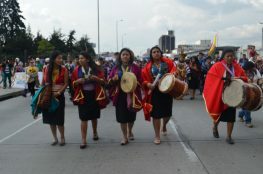 On 12 October more than 6,000 indigenous people marched in Bogota, to demand the implementation of the peace agreement. They came to the city to remind us that their territories are where life begins, but also where it is being extinguished. They know that salvaging the peace deal is not the end of the complex problems they face, especially when the economic development model is based on the promotion of mining, energy, forestry and agro-industrial sectors, but it allows them to carry on defending their lives, and all of our lives. Supporting minorities in Colombia is more crucial now than ever. The narrow margin that gave the NO to peace a victory, left us all asking, ‘And now what? What can we do? How we can move forward? Who can do something?’ These questions are even more meaningful when they are asked by indigenous people and Afro Colombians. And while we are still looking for answers to these questions, people around Colombia have already started to mobilise demanding Acuerdo Ya! (Peace Deal Now! ), and many spontaneous social movements, such as Paz a la Calle (Peace to the Streets) have emerged. The international community has ratified their support to the peace process and exerted certain pressure on the government. The Nobel Peace Prize given to President Santos is an example of this, the prize is symbolic, a cry to move the negotiations forward so that an agreement can be reached as soon as possible.